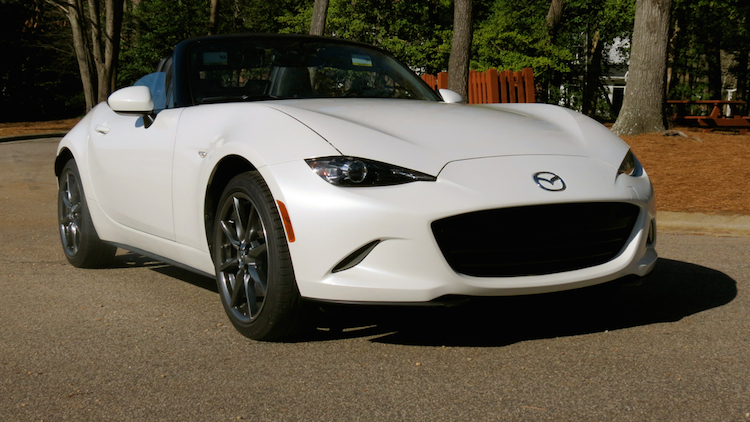 You’ll sport a Miata-like smile when you drive this roadster with the roof down. Heavy pollen and spring rains are in abundance in my area at this time of the year, which makes it difficult, if not downright challenging to evaluate any drop-top model. But the Mazda MX-5 Miata is one vehicle I do not see all that often, therefore when an opportunity to drive one appears, you make it work. Fortunately, there were enough gaps in the green-yellow haze and precipitation to grab a few hours of unimpeded top-down driving. 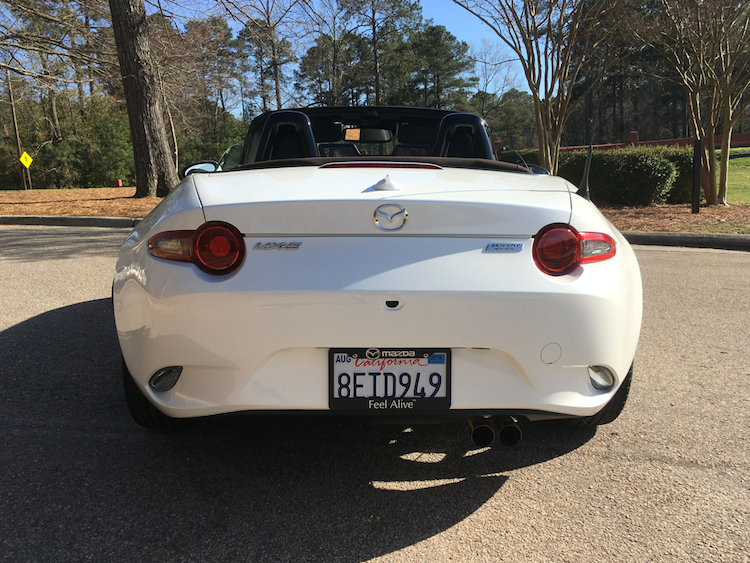 I’m glad I did as the Miata reminds me why this vehicle remains an enduring favorite — there is no other model quite like it, a budget roadster that recently marked its 30th anniversary. That’s right, the little roadster that could, celebrated its 30th anniversary at the same venue where it was initially introduced — the Chicago Auto Show. The Miata is now in its fourth generation, with the current version released in 2016 and updated since. Mazda prices the 2019 MX-5 Miata from $25,730 for the Sport edition, $29,590 for the Club, and $30,780 for the Grand Touring. Add $920 for the destination charge ($965 in Alaska). Add $1,350 to upgrade to the automatic transmission. The changes for this year include an updated engine with more power, a standard rearview camera, a tilt-and-telescopic steering column, and an available GT-S package for the top-trim model. Mazda offers a few package options with the Miata. With the Sport edition, you’ll find the I-Activsense Sport Package ($850) with low-speed automatic braking support, lane departure warning, blind spot monitoring, and rear cross-traffic alert. For the middle trim, Mazda offers the I-Activsense Club Package ($450) with low-speed automatic braking support and lane departure warning. You’ll also find a Brembo/BBS Recaro Package ($4,470), which adds the items mentioned in its name along with an aero kit and heated front seats. On the top Grand Touring trim, you’ll find the GT-S Package ($550). This one adds a limited-slip differential, Bilstein dampers, and a shock tower brace (front). 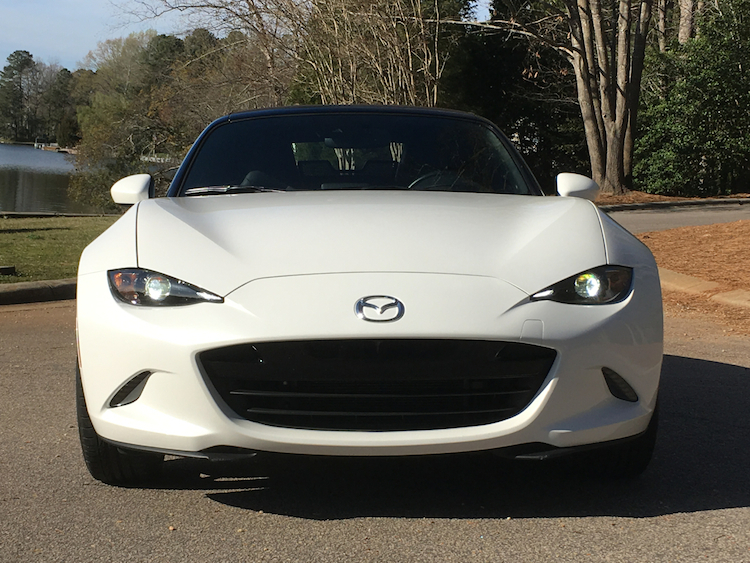 Its miles of smiles with the Miata, as evidenced by its dimpled front fascia. The look is as close to a human face as you’ll find in any car and that’s one of its attractions. The Miata’s frame is tiny, with the arched hood you also find in far more expensive models, such as the Corvette and Jaguar F-Type. The smallest of all cabin areas is dominated by a soft-top roof. From the rear, the deck has a subdued haunch and a similar dimpled look of the front. Standard features include LED headlights and taillights, daytime running lights, 16-inch aluminum-alloy wheels, front and rear stabilizer bars, and an independent rear suspension. The list of upgrades include LED daytime running lights, an adaptive front lighting system, a sport-tuned suspension, 17-inch alloy wheels, and brown or dark cherry cloth roofs (upgraded from black). Inside, space is at a premium. If you’re taller than 6 feet, there is a good chance you won’t fit inside. I’m a smidgen below that height and I found the space quite snug. This year, Mazda adds telescoping to the tilt steering wheel, which makes it easier to adjust your overall driving position. Still, the interior is the smallest we’ve seen in just about any production model. The list of standard features include full power accessories, push-button start, air conditioning, and cloth seats. Heated front seats and leather trim are available. Mazda supplies the Miata with a six-speaker audio system. You’ll also find Bluetooth, two USB audio input ports, and the Mazda Connect Infotainment System. The latter includes a 7-inch color touch-screen display, HD Radio, and various apps. Upgrades include a 9-speaker Bose audio system, satellite radio, and a navigation system. Among safety features, the Miata gains its first-ever rearview camera. We mentioned the various safety options available with the package choices in the overview section. Perhaps the only omission we’d like to see is full adaptive cruise control with automatic emergency braking at any speed. Likely, that’ll roll out with a future model. Is the MX-5 Miata a sports car? You really cannot call it one, at least not in the eyes of purists. Typically, sports cars have six- or eight-cylinder power at the ready, while the Miata relies on a naturally-aspirated four-cylinder engine to supply motivation. That engine makes 181 horsepower and 151foot-pounds of torque, thanks to a high compression ratio, which squeezes out power and redlines at 7,000 RPM. A turbo might give it sports car cred were it available, but Mazda sees fit to utilize a naturally aspirated engine in all of its deliciousness. My test model paired that engine with a six-speed manual gearbox, which is, in my opinion, the ideal choice for this roadster. 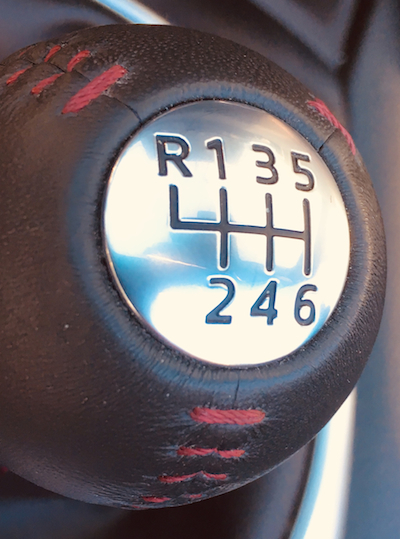 You can get a six-speed automatic, but if you like to row your own, the manual is the better choice. Happily, the manual moves through each with ease, with a clean clutch uptake enhancing the driving experience. While engine power is important, the Miata shines in all things steering and handling. This roadster supplies a connection to the road that equals what you’d find in many sports cars. Every slight movement of the steering wheel brings with it a corresponding movement of the wheels, which is especially delightful on twisty roads. You’ll detect some body roll while aggressively cornering, although it certainly isn’t unmanageable or unexpected. The available limited-slip differential is a must for performance enthusiasts. Step-off acceleration is modest as the little Miata steadily picks up speed. As mentioned, the shifts come smoothly. The engine is noticeably noisy, even with the roof up. No roar of a massive V8 here — just the whine of a very busy and capable four-pot. Thankfully, Mazda doesn’t create the fake exhaust sound common to some performance models. A modest hum is all the reminder you need. Dropping the top is as simple as releasing a releasing a hooked tab. Immediately, the windows drop part way and the roof separates from the top of the windshield. With just one hand, you can push the hood behind the seats and (if you’re strong enough) close it up from within the cabin. To close, a clip between the seats frees the roof from its storage compartment. You’ll then manually lift it, connect the hook in place and reclip. Keep in mind that dropping the roof consumes your very modest 4.9 cubic feet of storage space. A weekend bag might still fit, so there is that. It is hard for us to recommend any Miata model that isn’t the Grand Touring with the optional GT-S package. We just think that if you’re shopping for this roadster, then you’ll want the performance advantage this package provides. We’d also stay with the manual transmission, unless you’re using your Miata as your daily commuter in heavy traffic. Credit Mazda with keeping its Miata the fun driver’s car it has always been. Other than the nearly identical Fiat 124 Spyder, there are no direct competitors. Few manufacturers have attempted to deliver an affordable roaster, with each one eventually throwing in the towel to leave Mazda alone in the segment. Photos copyright Auto Trends Magazine unless otherwise identified as belonging to Mazda.